↑ Gosling, James; and McGilton, Henry (May 1996). "The Java Language Environment". http://java.sun.com/docs/white/langenv/Intro.doc1.html#943. ↑ Gosling, James; Joy, Bill; Steele, Guy; and Bracha, Gilad. "The Java Language Specification, 2nd Edition". http://java.sun.com/docs/books/jls/second_edition/html/intro.doc.html#237601. ↑ "The A-Z of Programming Languages: Modula-3". Computerworld.com.au. http://www.computerworld.com.au/index.php/id;1422447371;pp;3;fp;4194304;fpid;1। আহৰণ কৰা হৈছে: 2010-06-09. ↑ Niklaus Wirth stated on a number of public occasions, e.g. in a lecture at the Polytechnic Museum, Moscow in September, 2005 (several independent first-hand accounts in Russian exist, e.g. one with an audio recording: Filippova, Elena (September 22, 2005). "Niklaus Wirth's lecture at the Polytechnic Museum in Moscow". http://www.delphikingdom.com/asp/viewitem.asp?catalogid=1155. ), that the Sun Java design team licenced the Oberon compiler sources a number of years prior to the release of Java and examined it: a (relative) compactness, type safety, garbage collection, no multiple inheritance for classes -- all these key overall design features are shared by Java and Oberon. ↑ TechMetrix Research (1999). "History of Java". Java Application Servers Report. http://www.fscript.org/prof/javapassport.pdf. 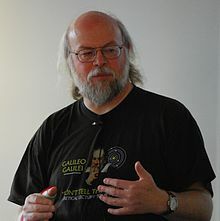 "The project went ahead under the name "green" and the language was based on an old model of UCSD Pascal, which makes it possible to generate interpretive code"
↑ "A Conversation with James Gosling – ACM Queue". Queue.acm.org. 2004-08-31. http://queue.acm.org/detail.cfm?id=1017013। আহৰণ কৰা হৈছে: 2010-06-09.